Artist's Concept of MAVEN, set to launch in 2013. This story was updated at 3:52 p.m. EDT on May 23. Inside an ultraclean facility in the foothills of the Rocky Mountains, engineers are constructing NASA's next Mars-bound spacecraft. The Mars Atmosphere And Volatile EvolutioN (MAVEN) spacecraft is being assembled by Lockheed Martin at their Space Systems Company facilities near Denver. The spacecraft's core structure and propellant tank were recently installed in a clean room, which protects the various components against contamination. "MAVEN is just starting to come together in the clean room," James Crocker, Lockheed Martin's vice president and general manager for sensing and exploration systems, told reporters during a recent site tour here. The large tank is more than 6 feet tall (1.83 meters), and is designed to hold 450 gallons of toxic hydrazine propellant. The MAVEN spacecraft's large hydrazine propellant tank is pictured prior to being installed in the core structure of the spacecraft at a Lockheed Martin clean room near Denver. Some of that fuel will be used to properly position the robotic spacecraft after it is captured into orbit around the Red Planet. 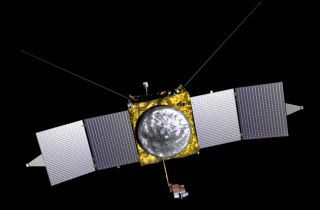 A series of rocket-motor burns will be used to lower MAVEN into its so-called science orbit. The $670 million mission is scheduled to launch in November 2013, and will reach Mars in 2014. "MAVEN is trying to understand what happened to the atmosphere," Crocker said. "Where did it go? It will help us understand how the gases in the atmosphere escape Mars." MAVEN will examine how much atmospheric gas is escaping into space, Lockheed Martin officials said. Once the current rate of atmospheric loss is determined, scientists can then use these figures to paint a picture of what occurred in the past. These measurements will help researchers see how the Martian climate has become increasingly inhospitable to life, NASA officials have said. The MAVEN spacecraft's core structure is successfully lowered and attached to the hydrazine propulsion tank and boat tail assembly at Lockheed Martin's facilities in Colorado. So far, work on the MAVEN spacecraft has been on budget and on schedule, Lockheed Martin officials said. The spacecraft is expected to be delivered to NASA's Kennedy Space Center in Cape Canaveral, Fla. next August. Meanwhile, NASA is preparing to land the Mars Science Laboratory, or Curiosity rover, on the surface of the Red Planet this August. The $2.5 billion rover mission will investigate whether Mars is, or ever was, hospitable. The Mars Science Laboratory and MAVEN are the only Mars missions currently scheduled to launch to or land on the Red Planet in the upcoming years. NASA recently announced an overhaul of its Mars exploration strategy, after the agency was forced to pull out of two European-led missions due to budgetary constraints.